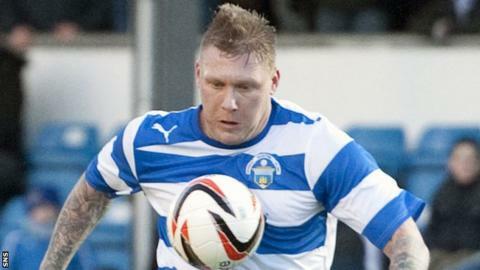 Garry O'Connor does not want to be pursued by his past. The only way to take control of a history dotted with misjudgements and indiscretions, as well as brushes with the law, is to use it. The 33-year-old is player/manager of Lowland League side Selkirk and has ambitions to progress in management but also to use his own story as a warning to young players about the pitfalls they can encounter in football. O'Connor was once a rising star. He scored 46 goals for Hibernian and earned a £1.6m move to Lokomotiv Moscow that provided him with around £16,000 per week in wages and numerous bonuses. He played for Scotland and, later, Birmingham City in the Premier League. He had tattoos, styled hair, expensive cars. All of it, now, seems only to highlight the extent of his downfall. He is reported to have lost £4m, he failed a drugs test while at Birmingham and he was caught by police in possession of cocaine during a second spell at Hibs. "There were three of us in a car, two police officers walked and there was a white powder in the car," O'Connor said. "I'm not saying whose it was, but because of my profile, the blame gets put on me. "It's another bad choice on me, but it is what it is. I've moved on in life. I can't look back, I want to move on and focus on that. "Life's too short. I want to get into management or try to help kids get into football, give them the right advice. "I was in the spotlight, making thousands of pounds a week playing for Lokomotiv Moscow, Birmingham, every single person wants to be your friend. Then I had a scenario where I lost everything and nobody wanted to be your friend - they were all hangers-on. "I spoke to the wife, got rid of my phone and cut ties with everybody. All I need now is my family and focus on my football career. That's how I can give the younger kids advice. "The Jason Cummings [of Hibs], he's in Edinburgh, he goes out quite a lot, he's one of those boys people are going to be hanging about. I don't know him as a person, but it just takes that wrong decision. "If I could go into Hibs, Motherwell, Dundee United and tell them my story, maybe it'll stick in one or two players' heads and help them in the long run." O'Connor lost so much, almost including his family, that discarding the "hangers on" became the easiest step to make. He talks a lot about not receiving the right advice as he left Scotland, at 23, for Moscow and at other critical points in his career. There is an acceptance, too, of his own responsibility. O'Connor has come to terms with a career that delivered great promise and memorable occasions but also mistakes. He can't change his history, only turn it into something of worth. "I never have taken drugs on a regular basis, it's just been the odd occasion," he said. "I've never been addicted to them. People think I'm just going boom, boom, boom, taking drugs non-stop. "That's just not the case. It's been the wrong thing that I've been in the wrong circles at the wrong time and taken substances, maybe that's a bit to do with depression or not starting football matches and sitting in a stand watching a game. I'm not a doctor, I can't explain that. "I felt good [receiving community service in 2012], because I got punished for something I'd done wrong. I went to work in a charity shop and I got pleasure from that because I got on great with the woman who worked there. "I was helping something out, ironing clothes, taking toys in, fixing DVDs, going to people's houses to pick up charity bags. It gave me a little bit of pride doing that." Amidst the clutter of a personal life that was, at times, out of control, it is possible to make out a football career that might have brought further reward. O'Connor knew how to score goals, was robust and quick enough to play in England. His move to Moscow in 2006 ought to have been the making of him as a player and an individual, but in hindsight, he may not have been ready for the dislocation. "To get the move to Russia was down to football and Hibs to get a great transfer fee," he says. "I had 15% of it, which was £300,000, which I pumped into the youth academy, which they built East Mains with. It was down to Hibs wanting it to happen. I wasn't keen on it. "The club was in a bit of trouble financially at that stage as well. I didn't want to go, there were other offers there from Rangers and down south. "I never had the right advice on how to cope with it. I had agents who wanted to push me here and there. "I never had anybody who would give me advice on the financial side, which I think I could help with getting into agency [work], helping people protect their money because it's such a short game. "I've done all these things, but if you dwell on them, they'll just get you down. I'm a positive guy now. Life's great." Brown back for Scots, but for how long?